This year's edition of "Terra da mare" race, held in 27 till 29. April, saw as many as 46 ships sail from Bari to Herceg Novi. Vast majority were Italian, with 6 Montenegrin, 3 Serbian and 2 with Russian crew. Impressive 24 meters long boat "Idrusa" of Grand Mistrall class, from Brindisi, has sailed into Herceg Novi City Port at 4:49:49 and was the first to arrive from Italy. One minut later, a smaller sailboat "Fetch 4" arrived, but won the race, based on handicap scoring. "Terra da mare" regatta, from Bari to Herceg Novi was held for 8th time, with participants from Italy, Montenegro, Serbia, Croatia and Russia. Race started on Wednesday at 3 pm, from Bari, with as much as 49 boats, and the fastest one was "Fetch", driven by Mauro Sciantantonico from CUS Bari. This impressive 22 meters long sailing boat has reached the finish line at Herceg Novi port on Thursday morning around 3 am. Little after, the fastest boat from the other side of Adriatic sea, "Black Mistery", driven by Sasa Kekovic from Herceg Novi, finished the race. Besides Kekovic's sailing boat, 13 Montenegrin boats participated on 8th Terra da mare regatta, from various Montenegrin clubs - Jugole Grakalić, Jovo Dabović, Mornar-Bar, Jug Montenegro, Lahor and Bokeška jedra. 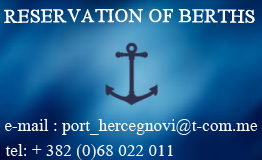 Regatta "Terradamare 2010" starts on April 28th from Bari to Herceg Novi. On April 30th in Herceg Novi, regatta of Boka Kotorska will be held, followed by a formal coctail on Kanli Kula fort.